Isle of Wight’s Wyatt & Jack are responsible for the Inflatable Amnesty movement, which is spanning the globe and now boasts their biggest single haul, the 5.5 tonnes of life-size inflatable Stone Henge, created by world-renowned artist, Jeremy Deller. Readers might remember the passing comment back in January about Isle of Wight small business, Wyatt and Jack, having a “life-size inflatable Stone Henge, hidden away in a secret location“. Well, we can now reveal a bit more information about this incredible 5.5 tonnes of plastic, which because of Wyatt & Jack’s Founder and Director, Georgia Lovell’s passion to prevent plastic going to landfill, will, over the coming months, be made into bags and accessories. 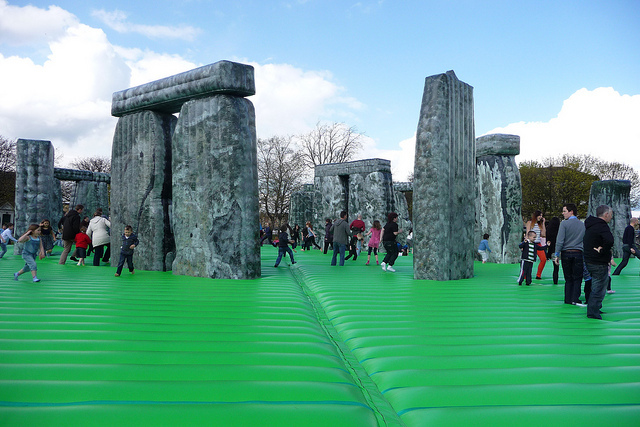 The life-size Stone Henge is actually an artwork by the world renowned artist, Jeremy Deller and was made by the same company that made the very first bouncy castle. We recommend popping over to Georgia’s blog to read the full story of how the life-size inflatable Stone Henge ended up in her hands. The acquisition is part of Wyatt & Jack’s incredible Inflatable Amnesty – a movement that has spanned the globe – the response to which Georgia told OnTheWight she was “blown away” by. Since July 2018 the company has managed to re-purpose around 15 tonnes of “broken inflatable weirdness” (not including Sacrilege). 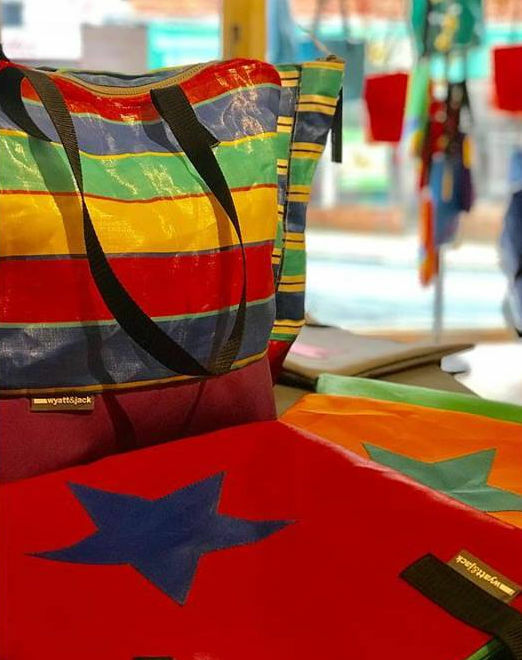 If you haven’t seen the products that are created by Wyatt and Jack, why not pop along to the flagship store in Union Street, Ryde. 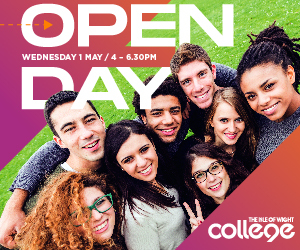 Check their Website for opening times. If you can’t get to the store, all the products are also listed on their Website. There are now at least 21 drop-off points (including Majorca) where you can leave your unwanted inflatables and they’ll be sent onto Wyatt & Jack. You can follow the journey of all unwanted inflatables via the Wyatt&Jack Instagram account.